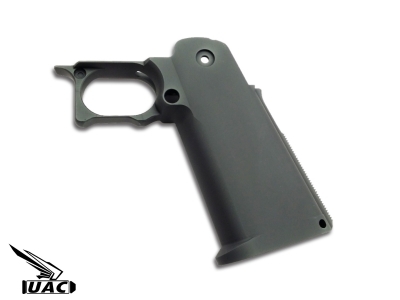 UAC Aluminum Blaster Grip is made from a single piece of aircraft graded 6061 aluminum by precision CNC. The trigger guard is modified and trimmed which is ready for a fast and solid grip. The grip is re-designed to have a slim body and ready for grip tape or laser engraving. Perfect fit for TM Hi-capa. 1 Grip, 1 Housing, PIN & Decoration Screw. The Blaster Grip is designed and best fit for TM / CP / Nova / Airsoft Surgeon / Airsoft Masterpiece / Gunsmith Bros frame. Other brands's frame may not be fit and modification is needed. The channel for the magazine is slightly oversized on purpose as to make sure the magazine will not slack after inserted to the gun. Installation of the grip will required intermediate knowledge / skill. Please consult your airsoft gunsmith if you have any problem on installation.